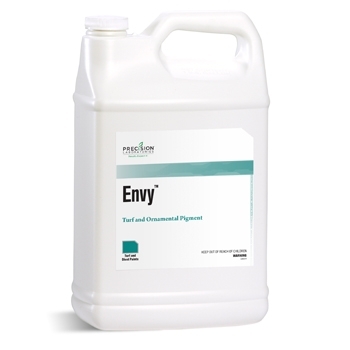 Envy™ is a combination of pigments and spray adjuvants labeled for application to turf, trees or shrubs. Envy may be used to improve color, mask injury or discoloration and improve the coverage of spray droplets on the leaf blade. 16 ounces per acre, applied in 50 gallons of water. 16 ounces per 50 gallons of water, applied to achieve leaf coverage.